Often recipes we enjoy in ethnic restaurants seem to elude us when we try to recreate them at home. Usually this is because we don't get the seasonings quite right. Sometimes the herbs and spices that are used in the recipe don't seem to appeal to our palate or our noses even though the dish we were served was divine. For instance, both Arugula and Cilantro have strong unusual odors that often put discerning noses out of joint. No doubt this is why the Mexican Herb, Epazote has never caught on. It is just too hard to get past that "old sock" aroma. In Infusions of Healing, Joie Davidow tells us that the name Epazote comes from the Nahuatl word for skunk, epatl, and that the Aztecs used Epazote medicinally to treat internal parasites. Epazote is an abundant weed in Mexico and parts of northern South America. There, its bitter, musky, lemon flavor is used to spice up everything from beans and squash to pork and crab cakes. Young leaves can be wilted and added to soups or stews or combined with other greens, just as chicory or sorrel would be used in early spring. It is often used with other herbs, like Mexican Oregano and Cilantro, and, of course, chilies. A tender perennial herb, Epazote has proven itself hardy in our Zone 8 winters. It dies back to the ground each winter but returns in spring. A heat loving herb whose flavors are best when grown in full sun, Epazote can be grown in a medium size container and placed on sunny window or under lights for the winter, if your winters dip much below 20. Epazote is best used fresh and sparingly, but it can be dried and stored for later use. Beware, we have heard it said that you can become addicted to the flavor of Epazote, not that this would be such a bad thing. How exciting to add a new flavor to our cooking; we might just have to reinvent some of those everyday dishes. 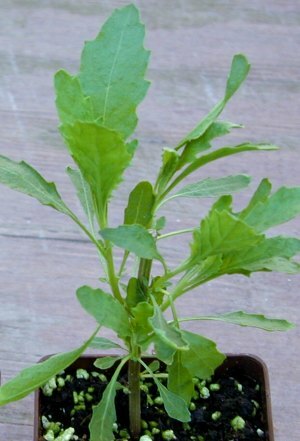 Epazote makes a great addition to our Gourmet Herb Garden Six Pack. This plant is sometimes available in plug trays. These trays hold 128 of all the same plant. They are a great low cost way to fill a lot of space. Each cell is 3/4 of inch by an inch. Check here to see if Epazote Plug Trays are available. Heat corn oil; sauté diced onion lightly. Add minced garlic, tomatoes and tomato paste. Cook until mixture is somewhat reduced. Add chicken stock, bay leaf, epazote, cumin, salt and pepper. Simmer slowly 30 minutes. Strain through a fine sieve. Garnish each serving with a little avocado, cheese, chicken and tortilla strips. Makes 10 servings. NOTE: Epazote is a weedlike Mexican herb which adds a distinctive flavor. It is sometimes available at Fiesta and other Mexican specialty markets. Cilantro is an alternative.